← I Love His Blue Eyes, Too. Actually, it was Girls’ Day Out. Y’all know I can’t stay out past 5:00 these days. Momma gets tie-red. Kris and I are trying to squeeze in some one on one time with our kiddos before their little brother gets here and consumes a lot of it. So, Anna and I, well, Anna planned our Girls’ Day Out day. And, John Henry and Kris had a Boys’ Afternoon Out. I only have one picture of Kris and John Henry’s time together. Boys just don’t take pictures like us girls do. 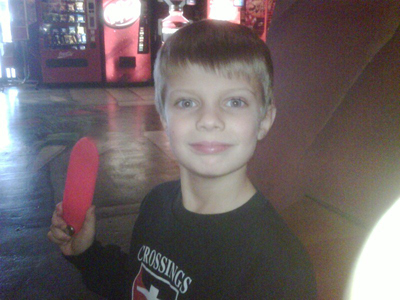 The boys went to Laser Quest to play laser tag, of course. Kris came home quite enthused and insisted that he and I go back together after Jett is born. Absolutely, that is the destination I was thinking. It’s like we are constantly thinking the same thoughts. Weird. They left Laser Quest and picked up pizza to enjoy with an evening of Darth of Vader finally telling Luke, “I am your father!” They had fun. And, good conversation – the really added bonus of it all. Anna knew exactly what our day should like from start to finish. Nothing begins a Girls’ Day Out quite like the short stack at Jimmy’s Egg. We drive by Jimmy’s Egg daily. 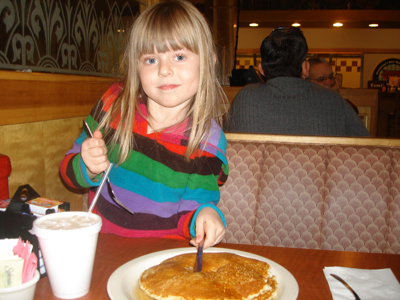 And, daily I hear, “Momma, let’s go to Jimmy’s Egg!” She got her wish. Along with the next three hours spent at the Paint ‘N Station. Yes. THREE HOURS. 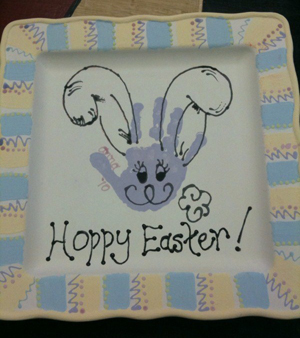 I had so much time on my hands, that I painted this little Easter platter using Anna’s handprint. I’m hoping that once it’s fired, it’ll look a bit more presentable. Anna could pick out ANYTHING in the store to paint. Of all the options, she picked a sugar dish. Because, every little girl dreams of having her own sugar dish. I think I was so delirious from paint fumes or waiting THREE HOURS for her to finish that I just clearly forgot to take a picture of her finished product. 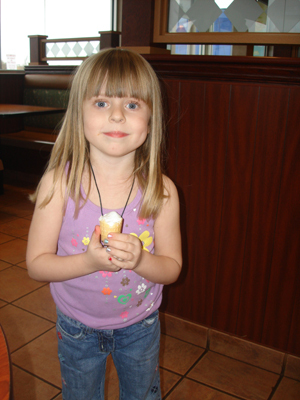 We finished up at McDonald’s for ice cream. It was not an unusually warm day in Oklahoma. A tank top was just her attire of choice. It was Girls’ Day, after all. 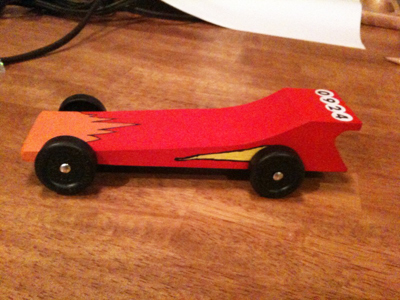 Kris and John Henry closed the weekend building John Henry’s Pinewood Derby car for Cub Scouts. Thank the good Lord Kris was around to help cut out this baby. The only thing I can cut from a block of wood is…. Hmmm. Well, I don’t think I can cut anything from a block of wood. So, I’ll stick with pancakes, painting, and ice cream. I am accomplished at eating. That is for certain. Tell JH that Mimi thinks that is a really COOL car!!! Thanks, Mimi! I sure will! Love, love, love the platter!!! I want you to take me on a girls day out….just sayin! Great blog, wonderful that you thought of doing that before Jett comes! Not many do that kind of thing, that close to the end of pregnancy! I want to go with you and Bonnie for girls day out too! I want the platter…it is too cute….but i guess you need to give it to BG….and that is some car…GREAT JOB JH…. Pinewood Derby Rocks! The car looks awesome.